Shipt / Time is Money! If you are like me you like to save time anywhere you can. I seriously dislike going to the grocery store, finding a parking spot, finding a cart, picking out my groceries, getting in line, going back to the car and driving home only to unpack my groceries. I ran across Shipt about a year ago and have since used it 34 times. Shipt is an app that you sign up for either monthly or annually. First of all, you enter your zip code to make sure Shipt is in your area. If so, your grocery store will pop up. Choose your plan. I chose the annual plan. Next step, add your payment information. Easy as pie! Piece of cake! Now you are ready to shop! Browse categories and add items to your cart. So easy! After you complete your order you are asked to choose a delivery time. Shipt is something like Uber where a Shipt Shopper will claim your order. You will receive an email confirmation when your order is claimed and your delivery time is verified. From that point on your shopper will communicate with you however you request (via phone call, text, email) and ask you any questions that come up and let you know if anything is not available. After your order is delivered you are sent an email and asked to rate your shopper and given the option to tip if you want. TRANSACT is the one show focused solely on the business of payments! "Powered by Electronic Transactions Association (ETA), the world’s largest payments industry trade group, it’s the place where innovators gather to make the deals that shape the industry." I am super excited to once again attend Transact! Not only is it held in one of the most exciting cities in the world (Las Vegas), it is showcasing the latest in groundbreaking technology, security trends, offers networking opportunities and much, much more that those of us in payments find fascinating! Of particular interest to me this year is the CPP Review Course. For those of you unfamiliar with "CPP", it stands for "Certified Payments Professional". As a result of increasing governmental scrutiny and regulation, growing security and compliance requirements, and a host of emerging issues and trends, today’s payments professionals need to have a broad knowledge of the industry, the challenges and forces shaping its future. They must demonstrate mastery not only of sales, but of pricing and interchange; business process, operations and workflow; products and solutions; risk; and regulatory, compliance and security matters as well. We can thank ETA for providing the opportunity for payments professionals to grow in their knowledge and earn this certification. I highly encourage anyone in the payments industry or interested in the industry to explore ETA's website. It provides tons of helpful information that is priceless! What could be better than lunch at Cheesecake Factory on a slow Sunday? Lunch and paying straight from your smartphone, that’s what! I’ve gotten in the habit of going to Cheesecake Factory for lunch over the past 3 weekends…. The menu is huge and everything I’ve ordered there has been good whether it be edamame or cheesecake. Every time I come in I notice the large “CakePay” sign on the front door. Today I decided to try it out. You start out easily enough by going to the App Store and downloading it. Since I already set up Apple pay, signing up for CakePay was super-fast. You sign up and get a 4-digit code which you give to your server. Easy again. Next you can view your bill. You can decide to pay per item, which allows you to easily pay for your own leaving the balance for your dining partner. Easy again. I will definitely use this again. The Cheesecake Factory is always busy so anything that gets me out of the door faster is a definite plus for me. Interesting note from the server: He thinks that many people don’t use this because there are no rewards. He really likes the TGI Friday’s app because it has a good rewards system in place. He has used it 2 times and already has enough points for a nice steak. Something to keep in mind when you’re thinking about an app for your business. So convenient and I will definitely use it again! Have you ever noticed that more and more often you are being asked to give a tip to a person working at a counter? I'm happy to leave a tip to someone who provides me with an actual service, such as a server, hairdresser, etc. rather than someone just ringing up my purchases. In some cases, given the correct technology, I could ring up my own purchases, such as the self-checkout lanes at the grocery store. This seems to have started at coffee shops and has extended to places of business who use iPads or Square to collect payments. Instead of just a total, there's now a line for a tip on the screen. At first, I gave in and left a tip. After doing this several times I asked myself why I felt compelled to leave a tip for a cashier/counter person just because a line on a screen was asking for one? Just to not appear cheap to the counter person? Hmmm... I decided to overcome this "Technology Induced Guilt" as I call it and will only leave a tip if I want to. I wonder if this "tip line" results in increased income for counter personnel? According to Brian Roemmele, Alchemist & Metaphysician, "Once fully functional "Restaurant with Tip" software became available for these Payment Card Terminals a restaurant had an "all or nothing" dilemma: Either have a Restaurant Tip software running on the Payment Card Terminals or just standard retail software with no Tips. The machines simply could not switch between these two modes of operation." That explains things! Dave Park, CEO or Recombinant, Inc has this view, "A non-perfect solution perhaps, but whenever unexpectedly confronted with a tipline receipt, I scan the counter for a tip jar. If I see a tip jar or cup, I write 'cash' on the tipline and put a buck or two in the tip jar. If I don't see a tip jar or cup, I point to the tipline and ask the employee 'do you actually get this, or does your boss keep it? If the employee is the beneficiary, I'll write in a modest tip. I figure when in doubt, tip anyways. A buck or two is easy karma, and it always makes me feel better." Saturday morning I went to get coffee at Bee Coffee in downtown Indianapolis. I happened to notice the sign saying "Apple Pay accepted here". Woo Hoo! As you know, I'm excited to put new technology into play whenever I can. I went to the register and was told my total. I hit the home button on my iPhone twice, chose which card I wanted to use, held my phone over the contactless and chip reader (one of Square's products) and voila, my payment was made! Super easy! This technology is called NFC (Near field communication), it allows two devices to communicate with each other. This process is faster than magnetic strip, chip cards and cash transactions. Saturday is my day to go to the grocery. I went to Meijer and filled up my cart. Got in line with all the other pre-Easter shoppers. Since I was super alert due to my earlier caffeine fix I noticed that Meijer now accepts Apple Pay. Wow! Two in one day for me! The cashier told me my total. I followed the same protocol as at Bee Coffee and put my phone over the pad. In this instance I did have to sign since my total was over $50.00. I don't usually think of Meijer as being on the cutting edge of technology so, boy was I surprised. The cashier was super savvy and said a lot of people aren't aware that Meijer accepts Apple Pay. I am here to tell you that they do and it's awesome! What I like about using Apple Pay is it simplifies matters. There's no pulling my cards out of my wallet, struggling to put them back in, managing my wallet along with the receipt, a purse, and shopping bags. The check out process is quick and convenient for me as a consumer and quick for the vendor as well. Quick checkouts = more sales! 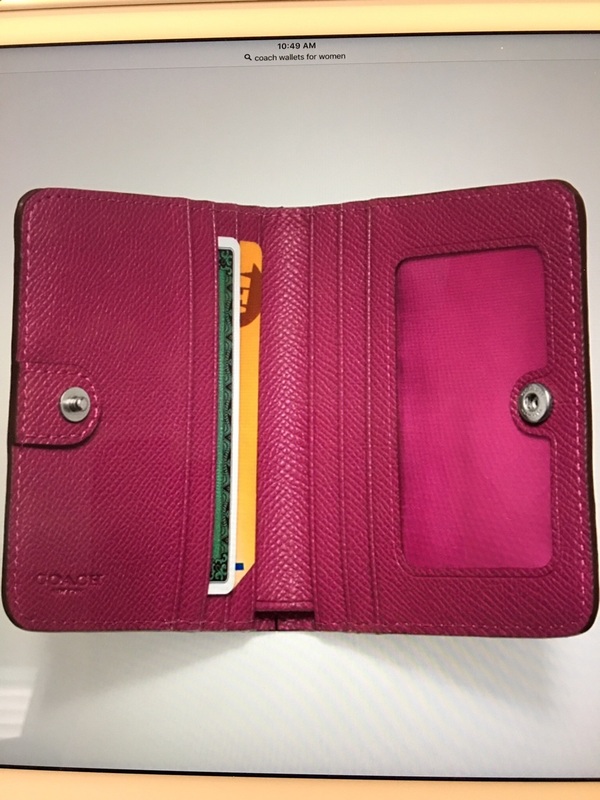 Below is a wallet. 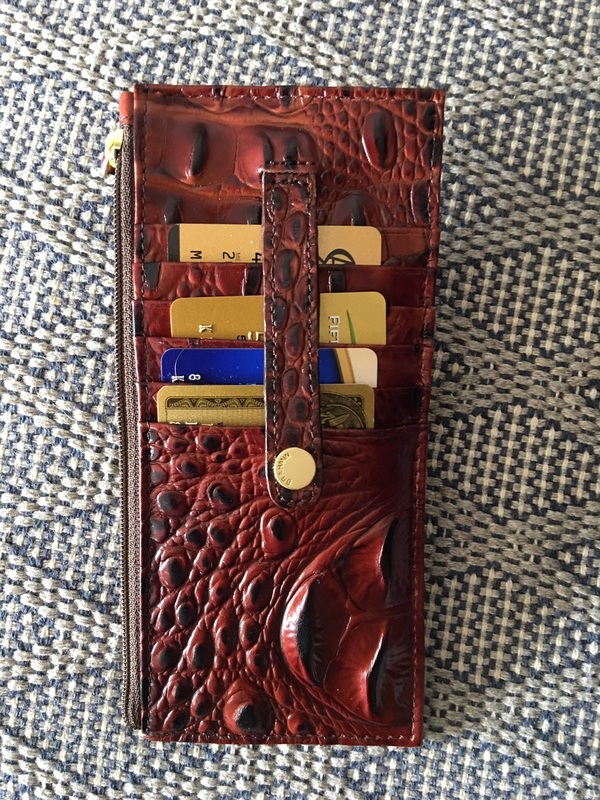 It holds credit cards, $ and identification. Recently I lost some credit cards and my driver's license. My wallet was not secure and these items fell out. I got online and requested a new driver's license. This was relatively easy since it could be done online. I called my bank to request a new debit card. This was a little trickier. I had to go into the branch. Like a lot of people it's difficult for me to go during the week. I had to wait until Saturday. I go in, go through the security doors and stand in line. When it was my turn, I told the CSR what happened. She requested a new card for me. She asked if I needed to make a withdrawal. I said "no, I'll just use my credit card and transfer funds online from my checking account". I added that "I do all that I can online." She smiled and said that works. I went on my way. A couple of days later, I go to log on so I could transfer funds from my checking account to my credit card account. The screen told me my password was not working and to "click here to change password". I tried that several times to no avail. I attempted to call my bank and was on hold for about 15 minutes. When I finally got through I was told that my online account was driven by my card number. Since my card was lost and a new one requested my online access was denied. Interesting....would have been nice if I had been told that in the beginning. This representative told me she would change my online access to be driven by my social security number, not my card number and I could use my same password. Technology is great, security is great, but sometimes human communication is not so great. Technology and processes were doing exactly what they were supposed to. Humans, not so much. Bottom line: I added my credit and debit cards to my virtual wallet. I also bought a new wallet from Zappos using an online gift card. Ain't technology great?! Questions: any capability to use virtual wallet at an ATM? What about digital identification? Christmas is over, New Year's Day has come and gone. I know that some of you have made resolutions that you may or may not keep. In the event that you have waited until the last minute to do your Christmas shopping, let me share what I have learned that will make next year's holiday shopping much easier! This year, the week of Christmas, I still had a few gifts to purchase. I was in a little bit of a panic until I got on to the Nordstrom website and discovered that you can shop online and specify which store. You shop that store's inventory, make your purchases, then pick them up at that store. Not only do they offer in-store pickup, they will also gift wrap your purchases AND bring them out to your car! Brilliant use of technology if you ask me! Months ago, Janet Jackson tickets went on sale for a show in Indianapolis to take place on January 29, 2016. I was excited and bought 4 tickets through Ticketmaster online. On Christmas Day, Janet announced that the Indy show (and many others) would be postponed due to a health issue. I debated for a bit whether I wanted to wait to see when or if the show would be rescheduled. Since it probably wouldn't be announced for a while, I decided to request a refund. Why should they hold on to my money indefinitely, right? I went to the Ticketmaster website and logged on to my account. There was a large button on the Janet Jackson event that said "Request a Refund". Pretty cool! No hunting and searching required. I clicked on the button and proceeded to request a refund. Pretty smooth process. The refund will be issued in 7-10 days. Although this isn't too long of a time frame, I would like to think they are under-promising and over-delivering. Why are charges posted so quickly to an account and refunds take longer? Hmmmm.....something to think about. Black Friday - Plenti of deals! I'm all for a bargain. I love rewards points and coupons, especially when Christmas shopping. As is tradition with me and my mother, we went shopping on Black Friday. I'm a dyed in the wool Macy's fan, love the deals and the awesome sales. I've also signed up for Plenti Points initially through Macy's. Since I primarily shop at Macy's I usually use my Plenti points there. What I love about Plenti points is that they show when I'm using my Macy's card. So easy! Nothing to look up! On Black Friday, I had $12.71 in Plenti points that I used towards a purchase. What that means, is in addition to Christmas shopping, I bought myself a little something. That's also the downfall of Black Friday shopping, too many good deals! Do yourself a favor and check out plenti.com. If you're spending money anyway, you may as well earn points, right? If you're not a Macy's shopper like I am, don't worry, you can earn points almost anywhere...AT&T, Exxon, Rite Aid and plenty more. Ha ha, see what I did there? Happy Shopping everyone! My iPhone 5 has a cracked screen and by today’s standards it’s out of date. I went to the mall to the Apple Store. I made an appointment online because I had heard that’s quicker than going in the store and making an appointment. The less people and steps I have to go through, the better! The very friendly salesman asked what I wanted and took my personal info. He asked about my carrier, which is AT&T. Using his handheld device he was able to interface with AT&T to get my account and new phone linked up. He also used this handheld device to accept my payment. If you decide to pay monthly, he can use his handheld device to initiate a credit report. He is the only person I had to deal with in the store throughout the entire process. His handheld device is the concierge to my new phone! He even activated my new phone while it was in the box. All I had to do was wait for my apps to load! "Paying in stores or within apps has never been easier or safer. Gone are the days of searching for your wallet. The wasted moments finding the right card. Now you can use your credit cards, store credit cards, and rewards cards with just a touch. Apple Pay is simple to use and works with the cards you already have on the devices you use every day. And because your card details are never shared when you use Apple Pay — in fact, they aren’t stored on your device at all — using Apple Pay on your iPhone, Apple Watch, or iPad is the safer and more private way to pay. For more info, visit the Apple Store http://www.apple.com/apple-pay/ "
I was very excited to set up Apple Pay in my new iPhone 6+. My MasterCard credit card info was already in there since I use it at the iTunes store. I did have to enter my security code from the card to verify. Next, I wanted to add my personal debit card. The app asked me to position the card in the scanner, and then manually add the expiration date and security code. This was super easy. I was directed to call Fifth Third Bank with the number provided in order to confirm. Next, I added my personal 5/3 Master Card Credit card. I again was directed to call 5/3 bank to confirm. I have to admit, I was on hold for quite a few minutes…. Next I added my business American Express Card. At my initial attempt, I had to cancel because my business email address had changed. I went to the American Express website to change my email address then went back to adding the card to Apple Pay. When Apple Pay connected to American Express, American Express automatically recognized my phone number so all I had to enter was the last 4 digits of my phone number to confirm. American Express was the most efficient in this process. All in all, this was a simple process, the most time was spent calling 5/3 bank. I can’t wait to use Apple Pay in an app and in a store! Stay tuned! a Zappos fan and my closet is not empty) Anyway, I go on to Overstock.com to look for a lamp. a meeting soon, so I decide to come back later for the lamp. I was curious to see what those terms are, so I clicked on "terms". I was taken to the terms, which was great; they even have a reader version. Since I was given the option to pay in 14 days after my order is shipped, I decided to wait to pay. What a great option when shopping for Christmas presents. A lot of people are paid every two weeks. This is similar to lay-a-way. Overstock has such a varied inventory; it would be a great place to do all of your gift shopping. I was ready to check out, I barely had to do anything! My email address and zip code is all I needed. So crazy easy! I couldn’t believe how fast and efficient that check-out was. When I checked my emails, I had received automatic confirmations as well. I highly recommend! UPDATE: I received an email from Klarna thanking me for buying at Overstock and telling me when my payment is due. They provided a link that says "Pay Balance Due: $25.94"
I clicked on the link and was given the option to pay by card. The card info was **** starred out with only the last 4 digits showing. I clicked on the card icon to pay and was told I would be sent a text message with a verification code to enter to complete my payment. I did not have to re-enter my card info, only the verification code. So simple! So easy! Thanks Klarna and Overstock! Anything I can pay online, I do. However, I still know quite a few people who pay via checks and snail mail. They are still not comfortable with their personal information being online. Some are quite conservative; others have been victims of stolen info. For these people, only shoring up security will entice them to pay online. Millennials – Mainstream or Martians? Millennials were born between 1984 – 1997. They are the tastemakers! They have a large amount of student loan debt. Ages 18 – 34 have the largest debt to income ratio. They are living under a mountain of debt. 15% say monthly income spent on student debt / 32% say they are not saving enough for the future / 25% say debt is keeping me from making major purchases. They are not your ideal customers if you are in the insurance, banking, retirement or wealth management business. It’s difficult for this generation to buy cars. This generation lives in a mobile first generation! Millennials have more education than predecessors. They can’t live without Facebook and banking apps. They value online and mobile rather than personal service. They are not happy with banks and despise Sallie Mae! They have a high mistrust of banks or simply have no access. We believe that the speed at which a customer receives an online purchase plays a very important role in how that customer thinks about shopping online again in the future, so at Zappos.com, we have put a lot of focus on making sure the items get delivered to our customers as quickly as possible. In order to do that, we warehouse everything that we sell, and unlike most other online retailers, we don't make an item available for sale unless it is physically present in our warehouse. "Zappos and Amazon sitting in a tree..." - Tony Hsieh, CEO of Zappos.com, Inc. I can buy shoes anywhere. With Zappos I almost can get them faster than making a trip to the local mall. Most companies do not offer free shipping both ways. If you don’t like something, send it back. Free Shipping! I’ve utilized this service and have been a VIP customer for quite a few years. If you want proof, just check my closet or look at my feet. I first became aware of Zappos while watching TLC’s What Not To Wear. I’m a loyal customer ONLY because of the outstanding service. Zappos is seamless. If I like something that’s out of stock, a pop up asks if I would like to be informed when the item is back in stock. I say yes and boom, I’ll be informed. No leaving the page or massive fill in page. If all companies modeled themselves on Zappos success will ensue! I attended the 2015 Money 2020 in October at the Venetian in Las Vegas. This event is described as "the industry’s primetime conference and trade show, Money20/20 delivers the biggest scale, best audience and most engaging event. Money20/20 is the largest global event focused on payments and financial services innovation for connected commerce at the intersection of mobile, retail, marketing services, data and technology. With 10,000+ attendees, including more than 1,000 CEOs, from 3,000 companies and 75 countries, expected at our 2015 U.S. event, Money20/20 is critical to realizing the vision of disruptive ways in which consumers and businesses manage, spend and borrow money." As a relative newcomer to the payments industry, I wasn't quite sure what to expect, would the information presented be too general or too technical? After reviewing the agenda and seeing some familiar names and companies I was pretty optimistic that I would find something to my liking and beneficial to my continued growth in this area. To my continued surprise I was engaged with the speakers and could continually relate to the issues discussed. For instance, during the session – Part I – Simplify Checkout: Create and Express Lane for Your Customers (Panel Members: Patrick Gauthier, Amazon and Mike Lowe, Golf Channel / NBC Sports) I learned that Golf/Golf Now, utilizes Amazon Payments. 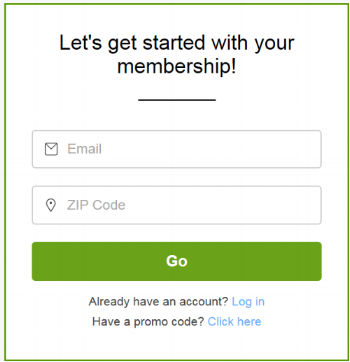 You can sign into GolfNow using your Amazon Account to reserve a tee time or create an account with GolfNow. If you sign up for a GolfNow account, as an incentive they offer rewards points to be used for discounts on equipment and hot tee deals. I was surprised to learn that thousands of businesses accept payments through Amazon Payments. On second thought, I’m not really surprised given the confidence most people have purchasing items through Amazon. During Part 2 – Future Proofing e-Commerce (Barry McCarthy, First Data; Andrea Thieman, Cabela’s) I learned that Sporting and Hobby Goods have the most increasing amount of digital sales. They say that payments made from the dashboard of your car are coming soon! Social Commerce: The Rise of the “Buy” button (Josh Constine, TechCrunch (M); Philippe Dauman Jr.,Twitter; Michael Haswell, Google; Satish Kanwar, Shopify; Michael Yamartino, Pinterest. During this session they discussed “Hosted Commerce” which is buying products on social networks such as Twitter, Facebook and Pinterest. Retailers need to sell where their customers are, hence the “Buy” button. I didn’t get a lot of details about what is actually being sold on social networks, other than it’s “not only the cheap stuff”. I think Pinterest is a given for this market. Since items you “pin” are complete with the product and store information. You can go back and buy at any time. Since the item information is saved on your boards, this is an automatic plus. There are many variables in these categories. I'm not trying to oversimplify, but I'm not trying to overthink the goals either. This is a mutually beneficial relationship, hand in hand, merchant to customer. My experience as a consumer is quite helpful to me in relating to ease of pay and processing. If it's easy, I will do it and I will promote it to friends and family. If not, I will be vocal in this regard as well. Today's customers want things now! We want instant payment, instant acknowledgement, instant receipts, instant rewards points, etc... We want to use our phones and our laptops. We want one stop shopping. Our lives are too busy to address envelopes and lick stamps. If it doesn't fit on a phone screen many of us are not interested. As said at one of the sessions, "The phone is the remote control for the millennial life." (Maya from GPShopper) We want to pay for parking from inside our car, we want to order up an Uber and we don't want to sign credit card receipts. We want to order our groceries online. We don't want to wait for our check at restaurants. The possibilities for the future are endless and exciting!